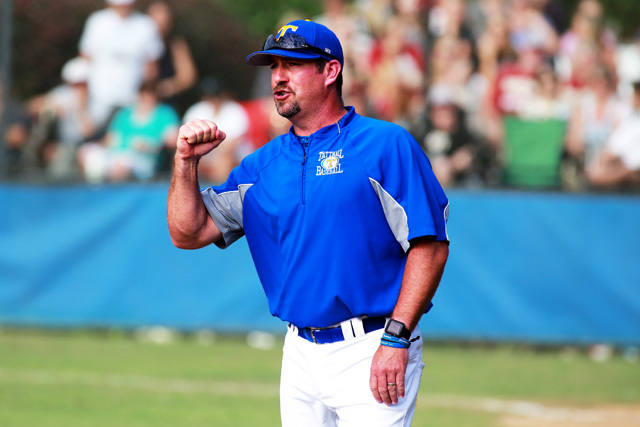 Just a few moments after the conclusion of Tattnall Square's 11-0 victory over Greater Gwinnett Christian Wednesday night, the public address announcer announced the victory was head baseball coach Joey Hiller's 500th coaching victory. "I don't think any of the guys had a clue," Hiller said. "A couple of them were like, 'Wow,' give the game ball to coach." Then Hiller took a humble approach when asked what he was going to do with the baseball. "I don't know ... probably put it back into the cycle for BP," Hiller joked. "I'll probably take it home, write 500 on it and put it on the shelf." The legendary coach has spent his entire coaching career at Tattnall Square Academy in Macon. He is the 27th coach in state history to reach the 500-win plateau. His career baseball record is 500-122. The Trojans were members of the Georgia Independent Schools Association until the 2014-15 season when they joined the Georgia High School Association. Hiller established the Trojans as one of the most dominant programs in the GISA. He took over in 1999 and led the school to eight GISA state titles and one runner-up finish in 2010. When the Trojans joined the GHSA, they continued their success, making the state semifinals in 2015. They defeated Hebron Christian for the Class 1A Private championship in 2016, then finished as the state runner-up last year to Savannah Christian. He entered the 2017 state championship series with 499 wins but lost both games, leaving him one shy of the plateau entering 2018. Hiller, who also is the head softball coach, captured No. 500 in the season opener Wednesday night. Pitchers Luke Laskey, Logan Fink and Brooks Gorman combined to allow just one hit in six innings. Meanwhile, Miles Morris' single scored a pair of runs, and Austin Marchman's RBI double gave the Trojans a 3-0 lead and all the offense they needed in the second inning. Then Tattnall scored eight runs in the sixth to put the game away. Laskey had a two-run homer, while Marchman, Morris, Kendall Logan Simmons, BJ Spears and Fink all doubled. Spears and Fink had two doubles apiece. "Tattnall has been a great place to do it at," Hiller said of the milestone. "But you don't do those kinds of things without great players and great assistant coaches. Three of the four assistants have coached with me since 2008, and the fourth played for me in 2008. "But we don't focus on stuff like this. It takes the focus away from what really matters and that is the kids and the program. It's about them going in and playing the game the right way. If we play the right way, the results are generally pretty good." Hiller said the Trojans are focused on trying to capture No. 501.